This cherub plaque is made up of sooooo many elements. 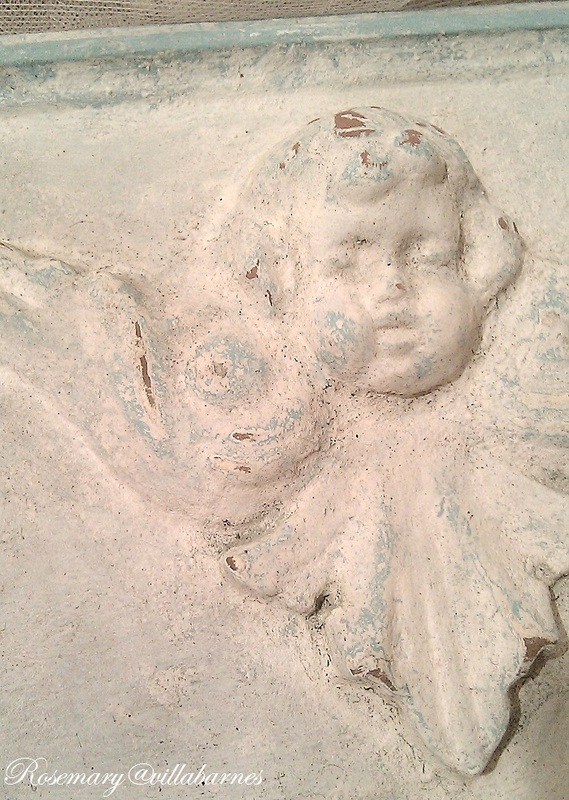 I envisioned an angel or cherub. I flipped the plaque upside down, and molded a cherub head out of clay. 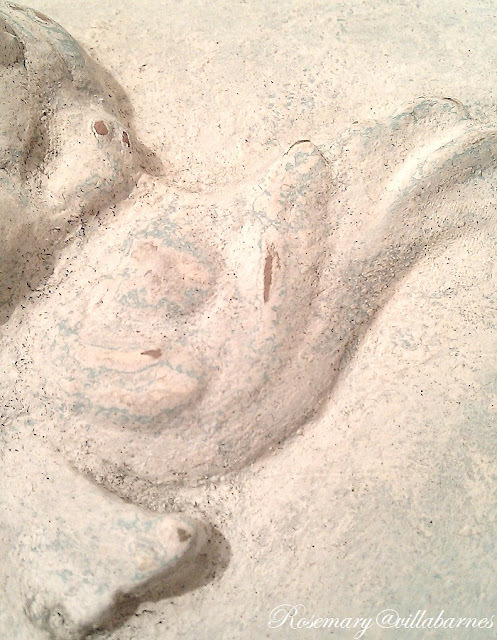 After I attached the head, I went over the entire piece with a white paint and plaster mixture several times. Then I painted it an aqua-like color, and went over it again with the paint/plaster mix. THEN, I sanded it a bit. THEN, I dirtied it up with a mix of dye and coffee. I do like my mixes. I banged it around, took a blow dryer to it, etc. 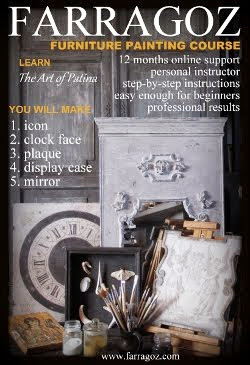 So, let's see.....This plaque is made of wood, clay, plaster, paint, dye, coffee, and determination. Still playing with tiara designs. Ideas are swirling like crazy. See ya soon. Rosemary your work is amazing!! You can tell alot of thought goes into each piece. Do you say coffee? Possibly my favorite food group. It is lovely. 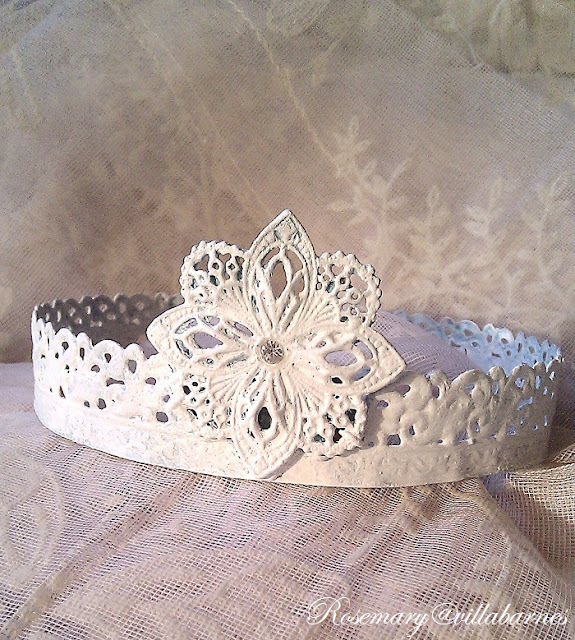 Oh Rosemary I missed out on that last tiara :-( .I would love one! Hope you will list another soon! 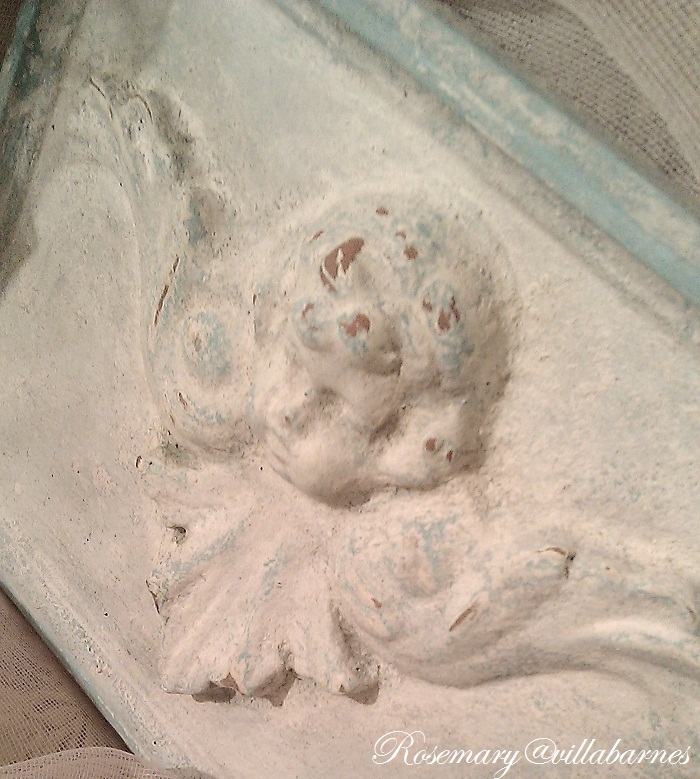 That cherub is beautiful <3! Rosemary as always excellent beautiful work! Okay Rosemary...seriously? You just molded a head out of clay?!?!? You make that sound so easy! Mine would end up looking like a piece of pooh or something!!! You are so talented. I feel you must have my share of talent, too. You are awesome! 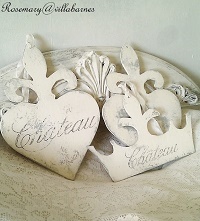 Love the finish on the cherub plaque, and each tiara is lovelier than the last one! Beautiful! Continually impressed with your talent and your creations. Another one of your projects that I love. Can't go wrong with cherubs and crowns. I agree with the last comment--who couldn't love Cherubs and crowns--especially yours! It looks like that bit of a rest has you fine artist mode now! The plaque is such a pretty and unique piece. That was very clever turning it around like that Rosemary. 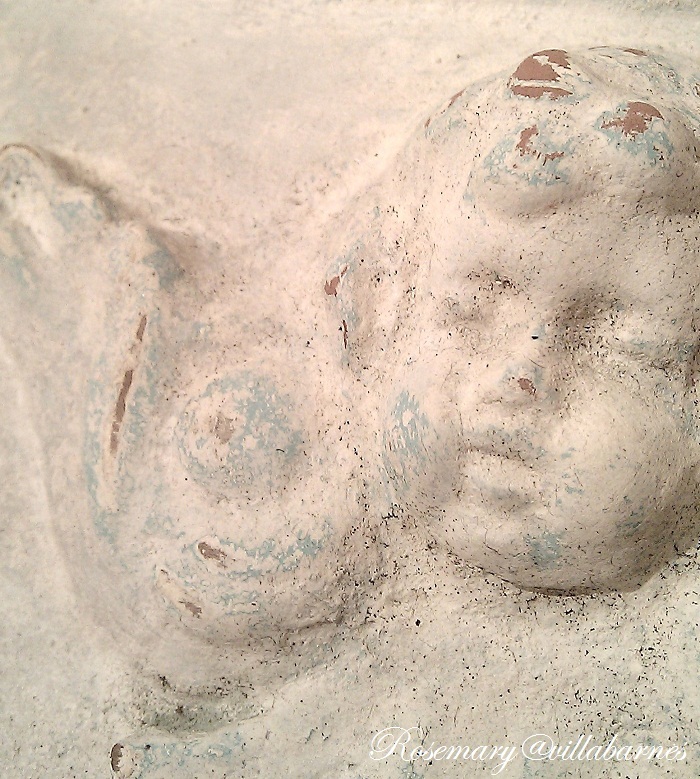 The cherub looks so sweet... you are an inspiration. So pretty, Rosemary! 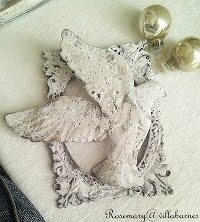 And cherubs are just perfect right now with Valentine's Day not far off. Stunning as always! And that tiara is just gorgeous!!!!! 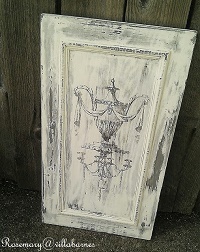 This pieces turned out stunning just like all the other gorgeous pieces that you do. I'm always inspired when I visit your blog! Awesome! You are so creative with the finishes. I want a tiara!! Girl, you amaze me with all your techniques, and all the time you take on your projects. I'll be glad when I can get back into the swing of things again. 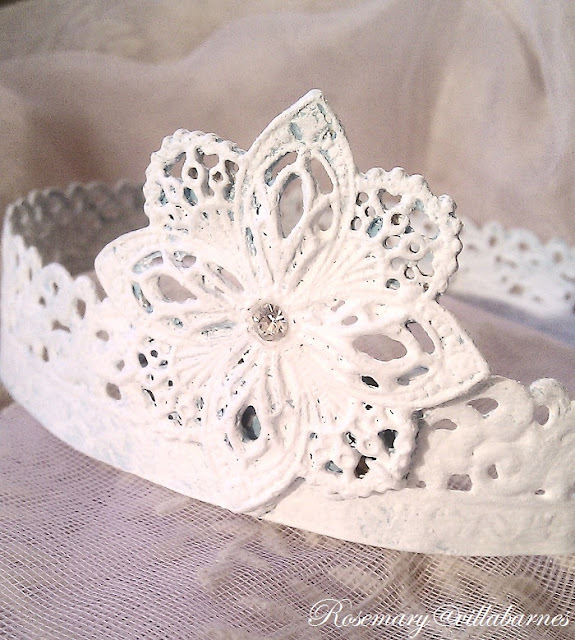 Hi Rosemary, I got a kick out of Donna asking if you wear your tiara's when you are creating...do you? 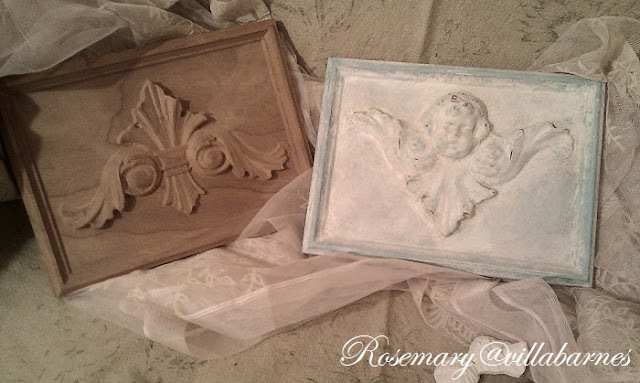 Your clay cherubs are lovely, I just adore the treatment and color, are you gonna be selling them? 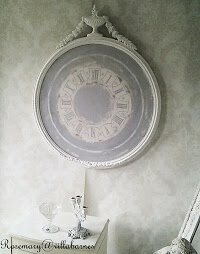 I think those wood plaques are pretty even as they are, if you plastered and painted them like you do. Still am just in awe of what you do with what you pull in from that garage, it's like magic! Hope you leg is still doing good. 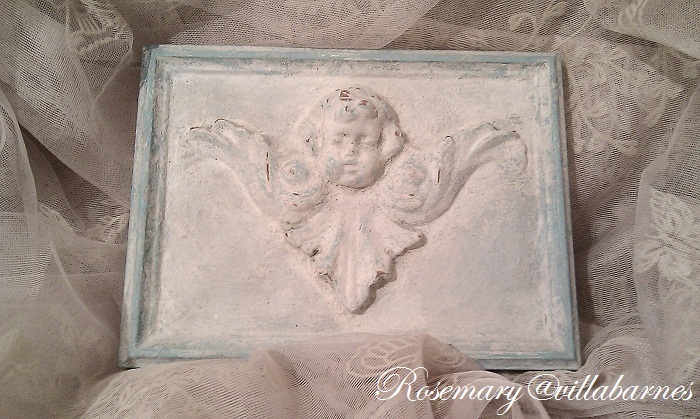 Rosemary...you are just remarkable!...the cherub is exquisite.....! Love the plaque Rosemary and the tiaras are gorgeous! I'm thinking about making some molds and I bought some clay going to try different types of molds until I find the easiest. Have a great rest of the week. 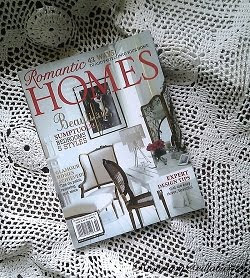 Hugs, Peggy~PJH Designs. Just beautiful Rosemary AND very clever! I was fooled...I thought you attached the whole angel to a board....such vision!! 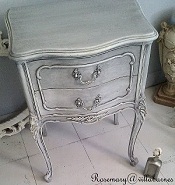 This is just beautiful Rosemary, I love it, you always amaze me with your talent.